Get out your dog walking shoes! 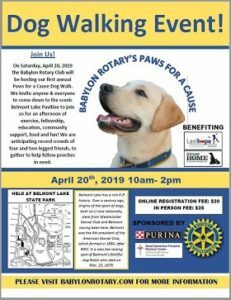 On Saturday, April 20th the Babylon Rotary Club will be hosting “Paws for a Cause”- a dog walk FUNdraiser – at Belmont Lake State Park from 10 am to 2 pm. This first annual event will benefit two Long Island animal organizations- Almost Home and Last Hope Animal Rescue. This entry was posted in Events, Home notification, News. Bookmark the permalink.